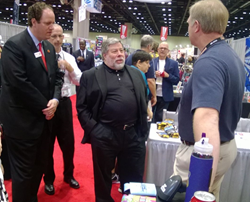 Apple co-founder Steve Wozniak advised an overflowing crowd at ASI Show® Orlando to seek original ideas if they want to be successful beyond their wildest dreams. For complete coverage of the show, including blogs and videos, visit http://www.asicentral.com. Upcoming 2015 ASI Shows are Dallas (February 3-5), Long Beach (March 24-26), New York (May 5-6) and Chicago (July 14-16). To learn more about exhibiting or sponsorship opportunities for 2015, contact Karen DiTomasso, vice president of sales, at kditomasso(at)asicentral(dot)com. The ASI Show was created for active ASI member distributors and suppliers, and attracts more distributors than any other industry show – with 20,000 attendees. Offering a full education conference, networking opportunities and an interactive show floor, the ASI Show provides a complete trade show experience.